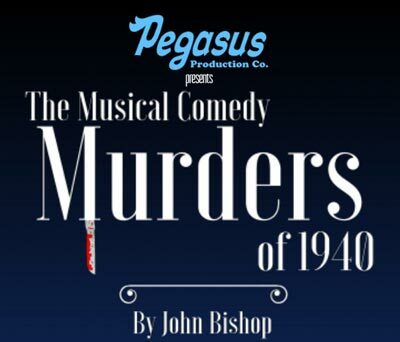 (LINCROFT, NJ) -- Marking the kickoff of their thirty-third season, Pegasus Production Company presents John Bishop’s The Musical Comedy Murders of 1940 at the Henderson Theater on November 9-11 and November 15-17. Set in 1940 at the mansion of Elsa Von Grossenknueten, The Musical Comedy Murders of 1940 centers on the creative team from “Manhattan Holiday”, a recent Broadway flop. They are back together seeking financial support for their new musical comedy. As the guests arrive a snowstorm begins, trapping them all inside. While the group attempts to rehearse they get caught up in the mystery of the “stage door slasher”. Fingers are pointed, secret passageways are discovered, and the true identities of all in attendance are revealed. Pegasus Production Company is a student-run company, led by a Board of Directors consisting entirely of students. Each production features student created sets, costumes, and technical designs.The production is overseen by director and CBA alumus Marcos Orozco, assistant director Christina Rak, and costumer Hillary Clauss. Performances of The Musical Comedy Murders of 1940 will be on November 9, 10, 16, and 17 at 7:00pm, November 11 at 2:00pm and November 15 at 5:00pm at the Henderson Theater on the Christian Brothers Academy campus at 850 Newman Springs Road, in Lincroft, NJ. Tickets cost $10 for adults (over 16), $7 for children, and $5 for seniors and CBA students. Tickets can be purchased at cba.booktix.com or at the door.